Half the fun in traveling is dreaming up the destination. 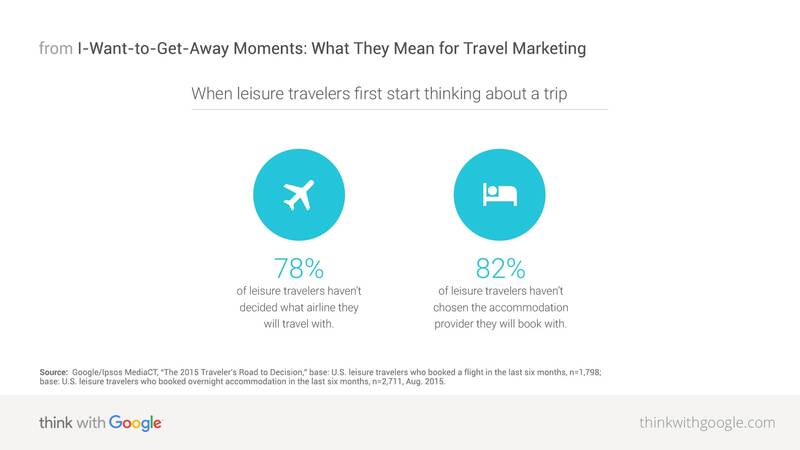 Part two of this six-part series on travel micro-moments dives into I-want-to-get-away moments—the dreaming moments before a trip is planned—and how travel marketers can capitalize on these early moments of inspiration. You know the feeling. Maybe you've just gotten back from your most recent trip. Or maybe you can't remember the last time you even took a trip. Regardless of when it strikes you, you can probably relate to the vacation itch. In these I-want-to-get-away moments, people are at the early stages of thinking about their next trip. They're exploring destination options and dreaming about what their next getaway could look like. Source: Google/Ipsos MediaCT, “The 2015 Traveler's Road to Decision,” base: U.S. leisure travelers who booked a flight in the last six months, n=1,798; base: U.S. leisure travelers who booked overnight accommodation in the last six months, n=2,711, Aug. 2015. Not only have travelers not decided on what brand they'll book with, but they don't necessarily have a destination picked out either. When first thinking about a personal trip, one in three travelers says they haven't typically decided on a specific destination.2 Since many travelers still have an open mind about where they'll go and who they'll book with, these are prime opportunities for travel brands to make an impression. Online interactions are increasingly shaping how people dream up their next trip. 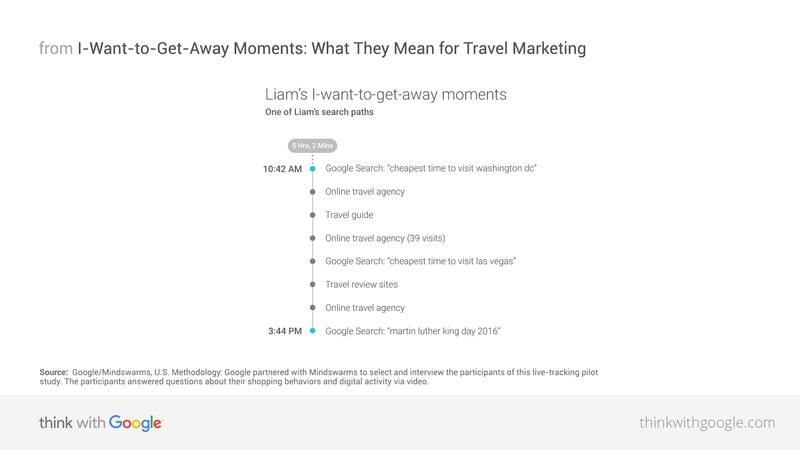 New clickstream data from Luth Research's opt-in panel (illustrating the pages a user visited, and in which order) provides a snapshot of what a real traveler's I-want-to-get-away moments actually looked like. 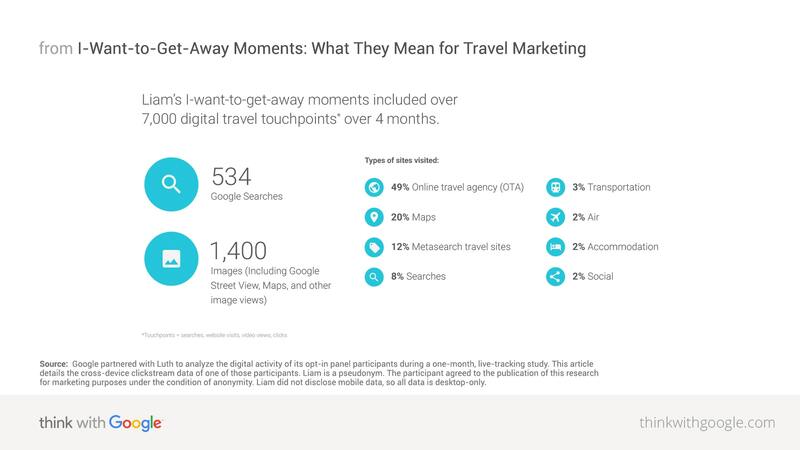 By analyzing this traveler's searches, clicks, website visits, and video views while he was in dreaming mode for his upcoming travel plans, we can start to see exactly how and how much digital played a role in influencing his destinations. Meet Liam. Liam is 30 years old, and he's not just planning one trip, but three: a vacation to Miami, a trip for his friends' wedding in the Northeast U.S., and his own destination wedding in the Dominican Republic. He's also open to planning even more travel, should he be inspired during his research. Source: Google partnered with Luth to analyze the digital activity of its opt-in panel participants during a one-month, live-tracking study. This article details the cross-device clickstream data of one of those participants. Liam is a pseudonym. The participant agreed to the publication of this research for marketing purposes under the condition of anonymity. Liam did not disclose mobile data, so all data is desktop-only. Source: Google/Mindswarms, U.S. Methodology: Google partnered with Mindswarms to select and interview the participants of this live-tracking pilot study. The participants answered questions about their shopping behaviors and digital activity via video. 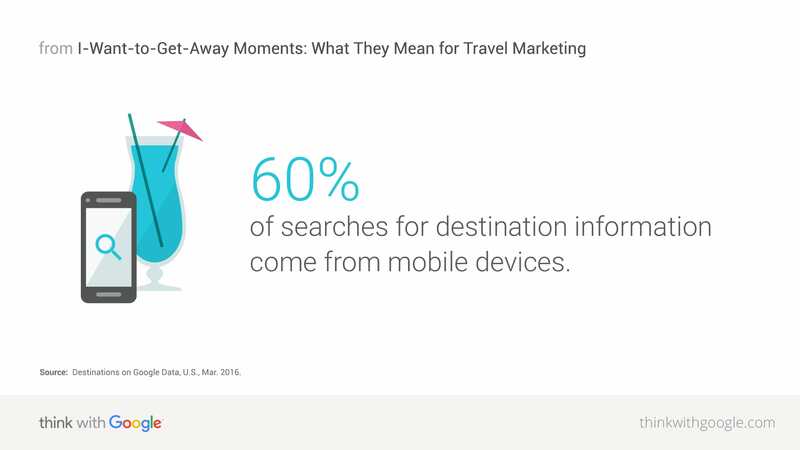 Ensure you're showing up for the searches people are doing in these moments—even on mobile. If you want to be in the consideration set, you have to be present in the I-want-to-get-away moments. And remember that the smallest screen increasingly helps plan the biggest of purchases, travel included. Source: Destinations on Google Data, U.S., Mar. 2016. Provide visual content for people's I-want-to-get-away moments, especially on mobile. When it makes sense, highlight what the experience will be like when they arrive, including what is available to see and to do while on the trip. 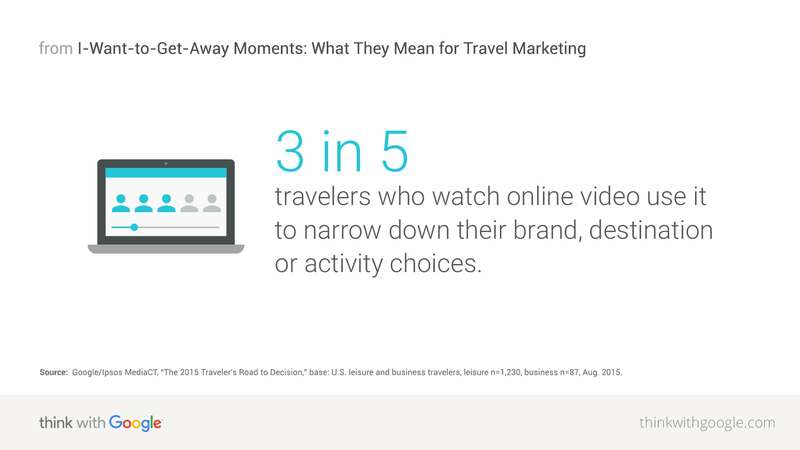 And travelers are watching more video on their smartphones. In fact, mobile screens are increasingly where travelers watch video: Approximately two-thirds of watch time for top travel videos happens on mobile.10 And that watch time on mobile devices has grown by over 65% year over year.10 This makes sense as travelers pick up their phones in slices of time throughout their day to learn about new places they want to visit. Source: Google/Ipsos MediaCT, “The 2015 Traveler's Road to Decision,” base: U.S. leisure and business travelers, leisure n=1,230, business n=87, Aug. 2015. Even though travel vlogs are the most viewed and most engaging type of travel videos, only 14% of vlogs on YouTube are created by brands; 86% come from YouTube creators.12 This is a good opportunity for brands: Make sure you're creating content that speaks to the needs of your audience in engaging formats. Marriott Hotels is a great example of a brand meeting travelers in their I-want-to-get-away moments. Marriott Hotels realized that next-generation travelers know that brands need to market to them, but they also appreciate entertaining and inspiring content offered in an authentic way. To build out content for travelers' I-want-to-get-away moments, the executive team appointed a VP of content creation, built its own in-house content creation studio, and created Marriott Traveler, an online travel magazine and content hub. Now Marriott creates vlogs and a wide variety of other online content. The brand focuses on documentary-style videos and has partnered with YouTube creators like Taryn Southern, Casey Neistat, and Sonia Gil to cover cities around the world. Marriott is also investing in longer-form content. Its 19-minute adventure Two Bellmen Two, set in Dubai, accumulated over seven million YouTube views in its first two months of release. To pick the destinations for these short films, Marriott identifies top searched-for destinations, using Google Search data and Marriott's own data, with the least amount of video content available. Virgin America has taken a different approach to meeting customer needs in I-want-to-get-away moments. Virgin America knows that its onboard amenities, comfortable seats, and hip mood-lighted vibe help set it apart in the airline industry. The brand wanted a way for guests who were unfamiliar with the product to experience it firsthand so they could realize what they were missing. The solution: an interactive brand campaign that allowed travelers to "test-drive" a flight before it took off. Virgin America initially used Google Street View, and then Google Cardboard (a simple-to-use virtual reality tool) to give potential customers a 360-degree interactive tour of its Airbus A320 cabin. This interactive tour was able to communicate the unique benefits of traveling with Virgin. Views of the ample legroom and in-seat entertainment offer transparency to people in I-want-to-get-away moments as they think about where to go and who to go with. This new experience has generated over 600,000 interactions and a 15% overall lift in unique site visitors compared to the year prior. Read on for the next article in this series. 1 Google/Ipsos MediaCT, "The 2015 Traveler's Road to Decision," base: U.S. leisure travelers who booked a flight in the last six months, n=1,798; base: U.S. leisure travelers who booked overnight accommodation in the last six months, n=2,711, Aug. 2015. 2 Google/Ipsos Connect, travel playbook omnibus, n=1,664, among U.S. travelers 18+, Apr. 2016. 3 Google/Ipsos Connect, travel playbook omnibus, n=1664, among U.S. Travelers 18+, Apr. 2016. 4 Destinations on Google Data, U.S., Mar. 2016. 5 Google Data, U.S., Mar. 2016. 6 Google/Ipsos MediaCT, "The 2015 Traveler's Road to Decision," base: U.S. leisure travelers, n=3,500, Aug. 2015. 7 Google/Ipsos MediaCT, "The 2015 Travelers Road to Decision," base: leisure travelers n=3,500; base: business travelers n=1,500, Aug. 2015. 8 Google/Ipsos MediaCT, "The 2015 Traveler's Road to Decision," base: U.S. leisure and business travelers who watched/commented on travel-related video, leisure n=1,230, business n=87, Aug. 2015. 9 Google/Ipsos MediaCT, "The 2015 Traveler's Road to Decision," base: U.S. leisure and business travelers, leisure n=1,230, business n=87, Aug. 2015. 10 YouTube Data, U.S., classification as "top travel-related" videos was based on the top 100,000 videos using public data such as headlines, tags, etc., and may not account for every such video available on YouTube. Mobile devices include smartphones and tablets. Jan.–Mar. 2015 vs. Jan.–Mar. 2016. 11 Google/Ipsos Connect, travel playbook omnibus, n=817, among U.S. Travelers 18+ who search for travel videos online, Apr. 2016. 12 Google/Pixability, YouTube travel study, YouTube analysis, Global-English, Apr. 2016.